It’s been all over the news. You’ve no doubt seen the coverage of the protests and the riots that rocked Baltimore, Maryland, for several weeks. On April 19, 2015, twenty-five-year-old Freddie Gray died following injuries sustained while in police custody five days earlier. Navigating the maze of media punditry has been no easy task in the weeks since the tragedy. Regardless of one’s opinion on the matter, one thing is abundantly clear: where and when Jesus Christ is the subject, light has permeated the darkness. Though it was the looting and hostility that dominated television screens across the country, our Church of God congregations on the ground tell a different story—a story of hope and healing. Celebration Church at Monroe Street is forever grateful to God for his hand of protection—no one in the church suffered personal injury or property damage, the church building was not damaged, and all the youth of the church were accounted for—not one involved in the looting or acts of violence. Celebration Church at Monroe Street is situated no more than five minutes from the corner of Fulton Street and North Avenue, a corner that was broadcast into living rooms across America through much of April. It was at this street corner where people witnessed a burning car and the lineup of police dressed in riot gear while enforcing the citywide curfew. The most remarkable developments related to this story, however, received little, if any, attention from the reporters and camera crews. Near the onset of the tragedy, Celebration Church at Monroe Street held their first-ever “Better You” conference, an event that focused on improving one’s spiritual, physical, and financial health. In stark contrast to the publicized violence, the community came together on this day to improve the lives of individuals, and ultimately, society. 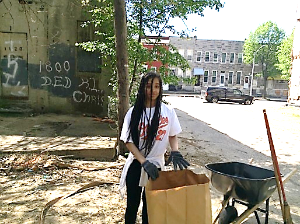 The church also held a prayer meeting wholly devoted to the needs of the city of Baltimore, and on April 25, rallied the congregation for a spontaneous community service day. Though the world may not have seen Christ’s love on full display over the networks, the Baltimore itself couldn’t help but notice the church’s love for everyone. Pastor Bob Washington was also one of hundreds of Baltimore pastors to gather at several other area churches for special times of prayer during and after those tragic days. There’s no question in the minds of our local Church of God pastors that people of all backgrounds, cultures, and levels of authority in government are working together to bring positive change in Baltimore. Though many across the country have cast the city of Baltimore in a negative light, within Maryland’s most-populated region, God is up to something redemptive, restorative, and remarkable. This entry was posted in All Church of God, Northeast and tagged Baltimore, Bob Washington, Celebration Church at Monroe Street, Church of God at Dundalk, city, Freddie Gray, Jeff Tomlinson, looting, Maryland, news, protests, riots, violence. Bookmark the permalink.